Timgad is an intriguing ancient city which was a Roman colony in North Africa. Today Timgad is entirely in ruins, but continues to attract tourists from around the world. 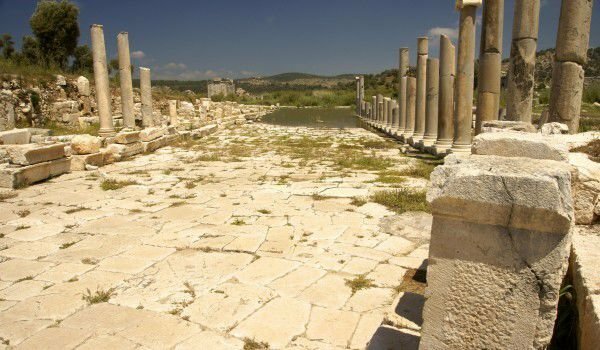 Known as Thamugadi, this Roman settlement is located in the land of Algeria. It stands next to the desert at the foot of the Aures mountains, about 35 km east of Batna. Timgad was founded 2000 years ago by Emperor Trajan as a military colony. According to the then ruler of the Roman plan of the city should be settled by freed soldiers from the legions of Trajan. Estimates were that Timgad had about 15 000 people and was constructed with everything necessary for such a large settlement. Over time, however, the city grew rapidly and strict organization of separate buildings outside the city had already been lost. The village was a kind of reward for the bravery of the Roman soldiers defending the empire with their lives and in Timgad they found all the amenities you could need. The whole name of the town was Colonia Marciana Ulpia Traiana Thamugadi. The master Plan of Timgad is reminiscent of a checkerboard field with two central streets Dekumanus-Max, (which is oriented from east to west) and Card – a street leading from north to south. These main streets were surrounded by impressive and beautiful Corinthian columns. Card leads to the Forum of Timgad and the intersection with Dekumanus Max, which also keeps track of carts on the stone pavement. This street, in turn, ends with a 12 m high triumphal arch. That is Trajan's triumphal arch, which was partially restored in 1900. The arch of Trajan was built entirely of sandstone in the Corinthian style. It has three arches, the central of which is 11 meters wide, and in some parts Timgad is known as the arch of Timgad. Statues that decorated it once, are sadly already gone. From the main hall of the Forum to date has remained only the floor of the Curia, where the leaders of the city sat. Opposite the court in the basilica is located the exchange. Today in Timgad, we can see the ruins of Roman baths. In these urban baths are preserved cellars of boilers, from which came steam, heating the rooms. There were warm and hot pools, gym cloths and sites for slow talks by Roman citizens. Among other buildings are the preserved theater with 3 500 beds, baths, library and the Basilica. Capitoline Temple in Timgad is dedicated to Jupiter and is approximately the same parameters as the Pantheon in Rome. Two huge columns crown the hill, which has always stood as the Capitol. It is dedicated to Jupiter, Juno and Minerva. Over 100 years before, the front facade of the Capitol had six columns and the temple inside the massive hall is divided into three narthex. In the vicinity you can see a church with a circular apse, which probably dates from the 7th century AD. Timgad keeps the remains of a large Roman theater. It once had a diameter of 63 meters and can hold up to 4, 000 spectators, proving that Timgad was the cultural center of the whole area. Among other attractions of the village is the library It is a two-storey building with semicircular niches for scrolls, cabinets for books and a book store in the yard. From an inscription it is clear that construction of the library is worth 400, 000 coins and financed by Marcus Julius. It is assumed that the library had about 25 000 volumes. To the south of Timgad is a large Byzantine citadel which was built after the abandonment of the settlement and the decline of the Roman Empire, in the later days of the existence of the city. In a corner of the square is preserved an inscription "to hunt, fight, play games and laugh. This is life." Timgad is listed as a UNESCO World Heritage Site in 1982.